NEW REWARDS: The famous artist and patient advocate, Regina Holiday, of the Walking Gallery has offered original paintings for our backers. See below and to the right for details! We created the Doctor 2.0 Conference in order to discuss and drive innovation in medicine from the Physician’s perspective. While this is our main focus, without the patient in the conversation it is easy to lose sight of the ultimate person with a stake in the innovation: The Patient. This is why every year since we founded this conference we have opened up free access to leading patient advocates and thought leaders, people like Regina Holliday and ePatient Dave Debronkhart. In 2013, with your help, we now are offering Patient Travel Scholarships as well to help get these important voices to our midst. Please support our cause by choosing a donation level at the right. To learn more about our conference or to attend yourself as a Physician or Exhibitor, please visit our main Doctors 2.0 site. If you’re a patient out there (and unfortunately, who hasn’t been? ), you want your doctors and other healthcare professionals to have all the right information at their fingertips— about you and about the latest in medical technologies. And you want to be able to have a conversation about all this with your doctor! We’re bringing all the healthcare stakeholders together to make things MOVE. That’s what Doctors 2.0 & You is all about. 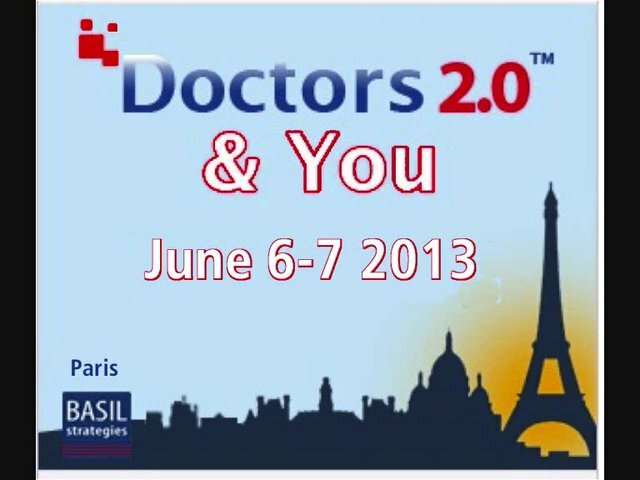 Doctors 2.0 is an international conference, taking place for the 3rd time in Paris on June 6-7 and it’s PATIENT INCLUSIVE. Yes, that’s right. We want patients from all over the world to attend. We’re making it free for patients to attend, but getting patients to Paris is the hard part. So, we’re raising money to make sure patients like you can come to Paris…and attend the conference! Doctors 2.0 & You is the only European event dedicated to bringing physicians into the picture, getting them to engage with web 2.0 tools & social media. And Doctors 2.0 & You is the only conference that really gives the floor to Patients — as advisors in the parallel sessions, and as members of our jury, judging posters and exciting start-ups. The conference will also offer a special look at the impact of the latest technologies, from mobile apps to connected objects, and social media and how they are affecting the traditional doctor-patient relationship. Patients who once connected mainly through email discussion groups and chat rooms will be talking about the new virtual communities that enable them to share information about treatment and coping IN PERSON! This is the chance for them build a personal network of friends and to discover how much they can accomplish through the Doctors 2.0 & You network. They’ll talk about their blogs, podcasts, and the use of WebTV, Serious Games (what’s that? ), and Big Data (lots of numbers). As with previous years, there will be plenary sessions, workshops and keynotes. There will also be a networking evening between the two days. That’s intense. AND they’ll get to do this with and in front of doctors, techies, and industry & government insurers from all over the world! We need more patients! There are literally hundreds of ePatients out there who want to attend. It takes about $2000 for a patient to travel to Paris from another continent and cover their accommodation. Doctors 2.0 & You empowers patients with a voice and with knowledge. Our conference motto? “Nothing about me, without me”. The E stands for: emancipated, empowered, enabled, expert, engaged. We need you to help patients gain the E, by donating to the travel fund! It is their experiences and passion that drives change and inspires innovation. Our conference gives doctors real time interaction with colleagues, with active patients, with tech experts, and with the tools themselves. E-patients provide feedback for new technologies and new ways of working together. We believe that this collaboration and instant feedback is what drives change and progress in a sustainable way. What’s at stake? The quality of care. This is all about engagement and the quality of care. Getting feedback and input from patients and doctors is key for all medical facilities. Learn what is important to your patients and drive both business and quality of care up! If you’re not interested in Paris, but you are interested in art, please check out Regina Holiday’s work here. She’s offering original painting for our donors who contribute 300, 500 or 1,000. Aside from the satisfaction of helping ePatients travel to THE web 2.0 conference of the year, by donating to the fund, partners will gain extra visibility! Our conference receives full social media exposure. In 2012, our #doctors2.0 hashtag received over 5,200 mentions with an estimated reach of 8.9 million people. Our sponsors will receive exposure across all media formats including web, mobile, table, in print and on television where we have over 22 hours of unique programming. Imagine your company’s name or institution’s logo all around the room! We attracted participants from 26 countries last year and fully expect that to rise to over 40 this year. In 2012 we attracted 27 media partners and anticipate over 30 attending this year. Our conference blog is also syndicated worldwide. These contributions will only be for the patients’ Travel Fund. Ideally, we’d like to offer 24 E-patient grants. How Do These Lucky Patients Get Chosen? A patient selection panel will review the applications and make judgments based on the impact a patient has in their community and to the wider world. We’re looking for patients who are really trying to make a difference. Do they use social media? If so, how? Do they engage with the many layers of the healthcare industry? And finally, we try and gauge what they’re looking to gain from the conference. We will give an e-patient exposure on our Facebook page to help them widen their reach! What a great way to attract readers to a blog! A DIGITAL COPY of one of our Eiffel Tower Photographs (pictured below) for your desktop, iPad homescreen or iPhone! As a thank you, and a way to bring Paris to you, choose a MOVIE (as shown below)! Choose either the classic Paris JE T'AIME or the widely acclaimed MIDNIGHT IN PARIS. As a thank you, and our way of bringing Paris to you, receive this KATE SPADE iPHONE 4 CASE (pictured below)!! As a thank you, and our way of bringing Paris to you, choose one of these handy PARIS TRAVEL GUIDES!! Both the Frommer's Guide and Lonely Planet (kindle version) will let you know which cafe has the best chocolate croissants and more! For more info, check out the pictures below. As our thank you, and way of bringing Paris to you, receive 2 8x10 signed copies of BOTH of the Eiffel Tower PHOTOGRAPHS (pictured below)! For 100, we'll mention an e-patient, doctor, medical facility or YOU on Facebook and Twitter. Send us their (or your) snazziest picture and a blurb about them (with links!) for us to post on our page! For $150, the above PLUS, YOUR NAME will be listed in the conference brochure. For $250, we'll FEATURE one of your blogposts on our website and we'll add your NAME to our conference T-SHIRT. COMPANIES: Be a Patient Travel sponsor. Get your LOGO and name on our WEBSITE and Conference bag! Immediately gain an audience of thousands! NEW: A REGINA HOLIDAY ORIGINAL! In return for your donation, receive a 18x24 inch original painting by Regina Holiday (to be completed within the 2013 calendar year). Themes and subject can be discussed with her. For those of you who don't know her, Regina is the artist and activist behind the Walking Gallery, and a widely doctor-supported patient advocate! Seen a guy wearing a painted suit jacket? That's her work! For the Conference: a round trip to Paris (within Europe) or 3 nights at a Parisian hotel for an e-patient! For COMPANIES: A 5 minute video (about your company) to be shown during the conference. For the conference: We'll feature one of our e-patients on the official conference website. FOR COMPANIES: We'll list YOU as one of our OFFICIAL PATIENT TRAVEL SPONSORS on the website, along with a link to your website. NEW: A REGINA HOLIDAY ORIGINAL! In return for your donation, receive a 24x36 inch original painting by Regina Holiday (to be completed within the 2013 calendar year). Themes and subject can be discussed with her. For those of you who don't know her, Regina is the artist and activist behind the Walking Gallery, and a widely doctor-supported patient advocate! Seen a guy wearing a painted suit jacket? That's her work! For the conference: we can bring an e-patient to Paris and pay for their hotel during the conference. For You: We'll also place your logo on the conference T-SHIRT, your name on the official website, and MENTION YOU (or YOUR COMPANY) at the actual conference. ALSO --- We will distribute your hand-out materials to our attendees or position your poster in a prominent area of the room! For COMPANIES: Sponsor our Coffee Break! During our main intermission, have your video playing on screen and have promotional card displays placed around the room on tables and chairs! For the Conference: Give an e-patient round trip transport FROM ANYWHERE as well as lodging and onsite food! For You: Your Logo on our shirt, your name and logo on our website, your promotional materials around the conference room AND playing your video of up to five minutes at the conference on the main stage. NEW: A REGINA HOLIDAY ORIGINAL! In return for your donation, receive an ON SITE painting by Regina Holiday (to be completed within the 2013 calendar year, on a mutually agreeable date). Themes and subject can be discussed with her. For those of you who don't know her, Regina is the artist and activist behind the Walking Gallery, and a widely doctor-supported patient advocate! Seen a guy wearing a painted suit jacket? That's her work!